ESA's Herschel space telescope has discovered that previously unseen distant galaxies are responsible for a cosmic fog of infrared radiation. The galaxies are some of the faintest and furthest objects seen by Herschel, and open a new window on the birth of stars in the early universe. To date, it is the most sensitive image of the universe taken with Herschel. A swarm of distant galaxies hidden behind a pervasive veilof cosmic fog has been seen for the first time by telescope European infraredspace telescope. 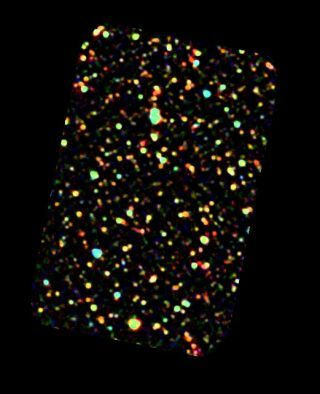 The newfoundgalaxies are the furthest and faintest yet spotted by the European SpaceAgency's Herschel infrared space telescope. They appear to be very young in the Herschel view, just 16percent of the age of the universe ? which is about 13.7 billion years old,researchers said. Thousands of stars are forming in the galaxies every year,they added. "We can use these results to study what controls starformation in these distant galaxies, and how galaxies like ourMilky Way formed," said study leader Dieter Lutz, of the MaxPlanck Institute for Extraterrestrial Physics in Germany. The far-infrared Herscheltelescope is the first space observatory capable of resolving most of the distantblur of the universe's ubiquitous cosmic infrared background into individualgalaxies. In all, Herschel uncovered about 1,100 previously unseen galaxies. About 300 of the newfound galaxies were spotted in a patchof space previously observed by the Hubble Space Telescope in its Hubble DeepField north survey. The remaining 800 were hidden behind the wall of infraredradiation in a region observed by the Chandra X-Ray Observatory in the ChandraDeep Field South survey. Both regions were part of the Great Observatories OriginsDeep Survey (GOODS) that combines the talents of several space telescopes fromEurope and the United States in orbit today. The cosmic infrared background is radiation that can appear opaqueto traditional telescopes and a blurry glow to those with infrared optics lesspowerful than Herschel. It comes from the cold dust of newly-formed star withinyoung galaxies. The European Space Agency (ESA) launched the Herschelinfrared space telescope in May 2009. The observatory is the largest, mostpowerful infrared telescope in orbit today. The discovery of these new galaxies were part of a series offirst Herschel findings announced by ESA officials this month.